Parody of the thrillers movie trailers. A group of teens gets tormented by one of their old friend,who is plotting to destroy the world. 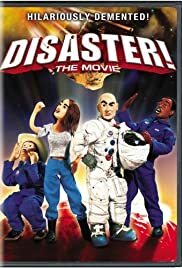 Courtesy of Masters 2000, Inc.
As the title suggests it is definitely a disaster of a movie. In the Netherlands I found this title in the 0,50 Euro bin, but it wasn't even worth that amount. The humor is over over over the top, the script would not have been approved even by a 12-year old who loves fart jokes and naked dolls, which is basically 3/4 of the movie. The endless repetition of this type of jokes made for a 90 minute film that felt like it had a running time of 90 hours. I'm afraid to be caught throwing the DVD in the thrash and somebody noticing it. It would reveal I actually watched this movie.